The animal and human funerals sectors are drawing ever closer, as demonstrated when hordes of visitors – including many vicars – descended on a stand manned by pet crematorium operators at a prestigious UK exhibition. The clergymen were fascinated to hear of the work carried out by members of the Association of Private Pet Cemeteries and Crematoria (APPCC) when they visited the National Funeral Exhibition. The operators hoped to raise their profile to put them on an equal footing with funeral directors and to get away from being unfairly lumped in the same category as waste removal contractors. 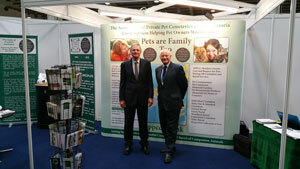 A banner proclaiming ‘pets are family too’ summed up the APPCC’s central message at the show. The main objectives were to underline the strict standards enforced on APPCC members and to encourage undertakers to provide pet services via the association’s Pet Funeral Arranger scheme. Nick Ricketts, APPCC chairman, said both aims were achieved with a steady stream of visitors to its display over the three days of the event at Stoneleigh Park in Warwickshire. “The APPCC recently introduced independent inspections for our members to offer even more assurance to animal lovers,” he said. “Inspections need to be independent and they need to be vigorous if they are to be meaningful – I can tell you from a personal point of view they are also unnerving! “Sadly this misconception has not been helped by several alarming cases reported in the media involving non APPCC members,” said Mr Ricketts. “Typically stories often involve people being given the wrong ashes back or being horrified to discover that their treasured pet had a terribly undignified send-off. Mr Ricketts was joined on the stand by APPCC vice chairman Steve Mayles and his wife Linda, and fellow members Paul and Chris Schramm, who run Essex Pet Crematorium. APPCC director Kevin Spurgeon, of Dignity, also attended, as well John Walsh, from Sheffield Pet Crematorium, and Penny Lally, from Penwith Woodland Burial. The APPCC is the only European organisation setting standards for pet cemeteries, crematoria and pet cremation that protect the pet owner and ensure their pet is handled in the way they expect.